With the migrant crisis frequently hitting the news headlines, we often forget the human stories behind the people involved. Migrants often face harsh conditions, such as unemployment. However, there are stories that tell us of people who are able to make the most of a challenging situation and create their own opportunities. The story of Ioanna is such a story. Ioanna is originally from Albania who trained a primary school teacher. After immigrating to Greece she was left unable to teach due to their system not recognising her qualifications. 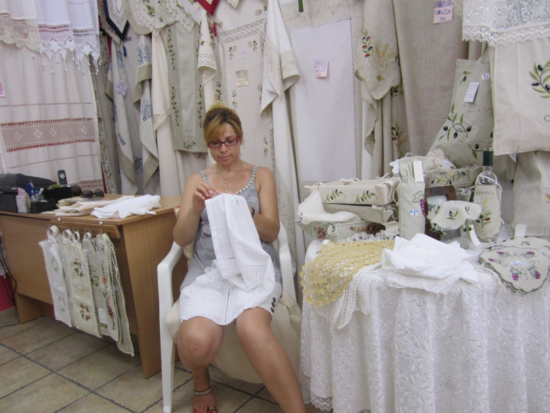 However, in 2002 Ioanna and a friend decided to open a shop in Rethymno’s ‘Old Town’ market, selling fabrics and crochet items, a skill she learnt from her mother and grandmother. After the success of her first shop, she opened a second shop in 2009. One of Ioanna’s best-selling products are small lacy curtains with ‘azure’ sewing that she made initially to meet the demand from the Scandinavian tourists. This item is unique to the Rethymno market. Due to Rethymno being a popular tourist destination, the town has a high-level of employment within the tourism sector, which has created many opportunities for immigrants to become entrepreneurs. Interestingly, Ioanna is a rare kind of entrepreneur in Greece, as a recent study that found only 4% of immigrant entrepreneurs are female. From this, we can see that tourism is able to provide many opportunities for those in unfortunate situations, as the economy is able to provide driven entrepreneurs with an opportunity to create a positive change to their situation, much like Ioanna.